the closing price of NIFTY MAY FUT was 10608. Closing price of nifty may was 10597.05, the same is being displayed, can you correct me if I am wrong. i have made video but cannot upload here. Price are not reflecting in. Real time. Can drop a mail to tsiva@zerodha.com, I can get this checked, it is fine from our end. @siva sorry then Kite market depth window displayed the LTP as close. it showed closing price 10608 and chart showed 10597.05 sorry for the wrong input. but i am mailing the data feed video to india@zerodha.com please check it. For now I want you to refer this, probing on this. Today also Market depth just froze for 30-40 minutes. Market depth just froze for 30-40 minutes. I din’t observed this nor anyone reported this. @siva Lines and patterns drawn on charts keep disappearing. Is there any limit here too? Is there any limit here too? 10 different scrips at a time, follows FIFO method. It’s really annoying to redraw patterns repeatedly during market hours. Would you consider it to make at least 30 or 40? The frozen market depth, lagging ticks, absurd candlesticks formations esp in lower TF, sudden disappearance of charts across all tabs, market depth not displaying at all instead 3 dots showing loading is displayed. These are all REAL issues faced by traders daily in kite. yes i have sent just now, sorry for the delay. Anyone else getting kite slow down ? 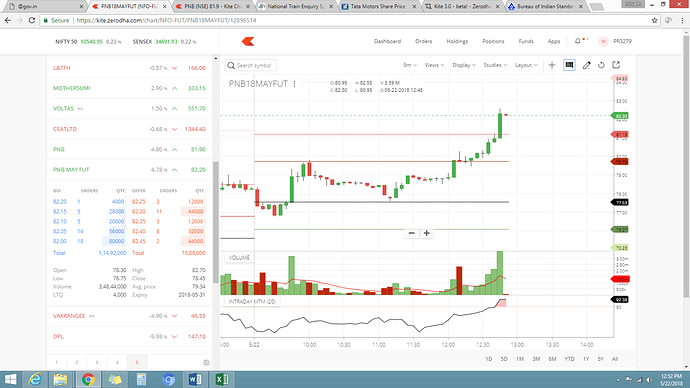 Data as per market watch shows the high as 82.70 whereas the chart shows the high as 82.55…what is happening with charts in kite? @siva @nithin can u please tell us the reason? can u please tell us the reason? Can you refresh and check once, can also check this.